On Saturday, the high school students of Niles West and Niles North danced with determination at their 14th Annual Dance Marathon. Held in Niles North’s gymnasium, the marathon is eight hours long and the culmination of a collective fundraising effort that runs throughout the entire school year. Chicago Coalition for the Homeless is proud to be the marathon’s primary beneficiary this school year. 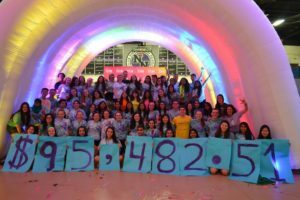 Over 350 students from the north suburban schools enlisted the aid of their peers, faculty, and the community to raise an impressive $95,482.51! CCH receives 90% of the funds raised and the rest goes to help fellow Niles students in need. The students chose to support CCH after hearing from staff attorney Diane O’Connell about the work done to protect the personal property and well-being of those living on the street. Students from both schools volunteered for CCH at events like Riot Fest and the August golf outing. Two busloads of students also travelled to Springfield in April to advocate with legislators for the release funding for homeless youth services. Members of our staff were delighted to be on hand at midnight when the final total was revealed.